Chutes and Ladders is a children's board game for two to four players. According to its manufacturer, Hasbro, the game is suitable for kids as young as 3 years old. They don't need to be able to read or to learn any strategic skills to enjoy a game. This game of chance also teaches basic counting skills and lessons about behavior and its consequences. Land on a good behavior square and you move up the board faster; land on a bad one and you move back down. Chutes and Ladders comes with a game board with 100 numbered squares, a spinner with the numbers 1-6 on it and four player pawns. You have to set up the spinner and the pawns before you start playing the game by punching them out of their sheets. Each pawn goes into a plastic stand. You need to put the plastic arrow into the spinner and attach it to the connecting base. The object of the game is for players to move their pawns along the squares based on their spin scores until someone reaches the last square and wins. Choose a player to start. You can do this randomly by having each player spin the spinner -- the player with the highest number starts the game. Set the direction of play to the left or right. The first player kicks off the game by spinning the spinner again. He then moves his pawn on to the board based on the number he spun -- so, if he got a two, he would move two spaces on the board to the #2 square. Play then moves to the next player. If a player lands on a square at the bottom of a ladder -- a good deed -- he travels up to the square at its top. If he lands at the top of a chute -- a naughty deed -- he has to travel down to the square at the bottom of the chute. The winner of the game is the first player to land on the 100 square. If a player gets lucky, she'll land on #80 -- this has a ladder that leads directly to the winning square. Otherwise, players carry on moving through the squares until they get close to the end. The winner has to spin an exact score to land on #100. For example, if she is on 98, she must spin a two to win. If she spins a higher number, she stays where she is for that turn. To add a bit of excitement to the game, incorporate an extra lucky spin. For example, if a player spins a six, he gets an extra turn after he has moved his pawn. Alternatively, if all the players are aged 6 years or under, you could give them an extra spin every time they spin their age. If you're playing with older children, it's worth setting a rule that they have to use the spinner properly through all the game -- savvy kids looking to get a certain number to win may work out that they can nudge the spinner to get the number they need. Chutes and Ladders is a simplified version of the English board game, Snakes and Ladders. It replaces snakes with chutes, possibly to make it less scary for younger children, and simplifies the game's moral message with pictures depicting good and bad deeds. Snakes and Ladders is a version of an ancient Indian religious game, Moksha Patam. The Indian game used ladders to show the rewards of being virtuous and snakes to show the consequences of vices. 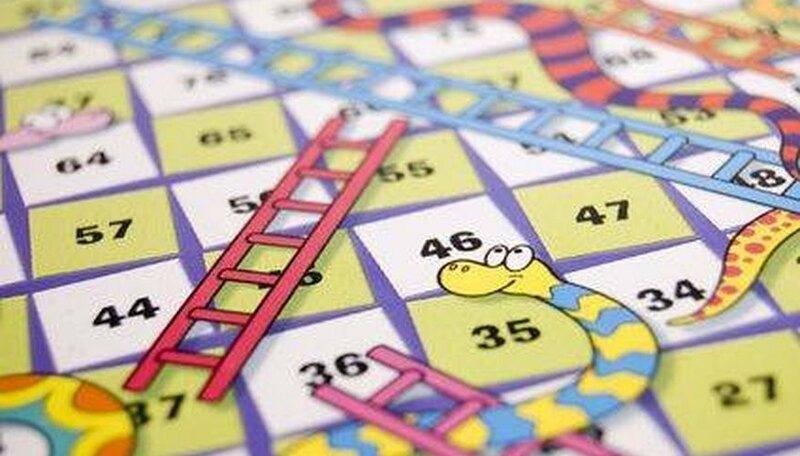 The rules of Snakes and Ladders are the same as Chutes and Ladders, although the game typically uses a die rather than a spinner. The Times of India: Who Invented the Board Game Snakes and Ladders?